Goodall shows slides of chimpanzees to illustrate occupational behaviors in primates. Jane Goodall, distinguished adjunct professor of occupational science, addressed occupational science and therapy students at Mayer Auditorium on Oct. 6. Goodall discussed her experiences observing the occupational behaviors of chimpanzees and the contribution these studies can make to the practice of occupational therapy. The lecture was sponsored by Pi Theta Epsilon – the Occupational Therapy Honor Society. 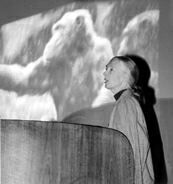 World-renowned for her work as an anthropologist, Goodall also presided during her visit to Los Angeles, the also presided over the opening of the newly renovated chimpanzee habitat at the L.A Zoo. The design of the new zoo structure was influenced by USC alumna Wendy Wood, whose doctoral dissertation in occupational science involved research on the benefits of “occupational enrichment” activities for chimpanzees at the L.A. Zoo.